Extend Your Wired Network at 1000 Mbps Speeds Extend your wired Internet access to any room in your house using your existing electrical wiring. Just plug the Powerline 1000 into any electrical outlet then plug in your device into the adapter. It’s that easy. With 1000Mbps speed and Homeplug AV support, the Powerline 1000 adapter is perfect for connecting smart TVs, streaming players, and game consoles. Next Generation Powerline Very fast speeds—up to 1000Mbps. Reliable Networking Connect multiple adapters to expand your wired network reliably. Latest Technology Gigabit speeds through your electrical outlets for improved coverage. Plug-and-play Setup in minutes, no need to configure or install software. Energy-saving Automatically powers down when not in use. Push-and-Secure Encrypts powerline network connections with the touch of a button. Smart TVs and players. Whether you're connecting your TV, Blu-ray™ or media player, you can avoid the hassle of running extra network wires. No need to rely on WiFi to watch your favourite movies and TV shows. Connect your TV or media player to the Powerline and enjoy wired Internet instantly. More Wi-Fi standards Create faster access for 802.11 b/g/n & AC Wi-Fi devices. Two Wi-Fi modes Extend existing Wi-Fi connection or create a AC Wi-FI access point. Gigabit Ethernet Port Connect a wired device like Blu-ray player, game console, smart TV or streaming player to your Wi-Fi network. Simultaneous dual band Wi-Fi Extend 2.4 & 5GHz Wi-Fi up to 1200Mbps & reduce interference. External antennas For better Wi-Fi coverage. FastLane technology Use both Wi-Fi bands to establish one super high-speed connection; ideal for HD streaming & gaming. 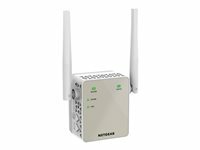 Boost N300 Wi-Fi Improve range and speed of your existing N300 Wi-Fi network throughout your home for wireless devices like iPads, iPods, laptops, smart phones, game consoles and TVs. Fast Ethernet port Connect a wired device like a Blu-ray player, game console, smart TV or streaming player to your Wi-Fi network. Push 'N' Connect Push 'N' Connect using Wi-Fi protected setup (WPS) connects computers and/or routers to the extender quickly and securely. Smart LED indicators Finds best location for optimal Wi-Fi coverage. 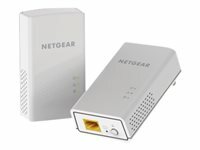 Compatible Works with any wireless b/g/n router or gateway from NETGEAR and other brands.